Worried about your toddler’s physical development? Maybe you see your friend’s toddler already walking and beginning to sit, but your toddler wants nothing to do with walking. The rate of each child’s development – both physical and cognitive– vary from child to child. Physical development in children can be divided into gross motor skills and fine motor skills. Gross motor skills control large muscles needed for physical activity. Fine motor skills cover hand-eye coordination and the small muscles in hands and fingers. 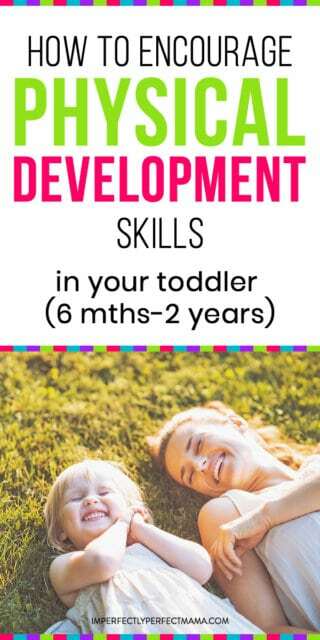 Both of these are important skills to help your toddler develop. From the age of roughly six months up to 2 years, you can help physical development through understanding milestones and providing simple activities for developing skills. Let’s look at the typical age ranges and see what your child can do as well as support accomplishing those mile stones. At roughly six to nine months, your child will likely be able to sit on their own without your help. Crawling while holding an object, pushing up from his or her stomach onto hands and knees, and moving from a crawling position to sitting are probably other skills you will see around this age. Your toddler might be able to stand on flat feet while holding on to your hands, and will begin using his or her thumb and fingers to grip objects. 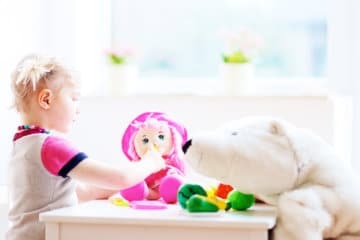 While these skills are commonly seen at six to nine months, your child might not have developed some of them yet; sometimes children are more advanced in one area compared to another. Instead of or in addition to the skills mentioned, your child may also be able to stand while holding onto furniture, crawl up stairs, step sideways while holding onto furniture, or move from a standing position to a sitting position. Fine motor skills might start to be evident at this age, with your child being able to point with an index finger and let go of objects. Allowing your toddler space to move about freely allows them to explore their nearby surroundings. Place your toddler on their tummy and let them wiggle about. This helps them learn how to move from this position into sitting, crawling, and possibly standing. Soft pieces of food help your child learn to grip with thumb and fingers, developing fine motor skills. Soft food also helps them to learn chewing skills; development of teeth at this point isn’t necessary to learn this skill. If your child’s favourite toy is just slightly out of reach, they might be more inclined to find a way to move toward it. At roughly nine to twelve months, your toddler will likely be able to crawl very well, and may be walking while holding onto your hands or furniture. They will probably be able to use a thumb and finger to pick up small items, stack them, and give objects to another person. Chewing small pieces of food should be evident as well. In addition to these skills, your toddler may also be able to use a spoon and drink from a cup, crawl up and down stairs, pull off his or her socks and hats, and walk while only holding one of your hands. If your child isn’t showing all or any of these skills yet, don’t worry! Your toddler may not be running a marathon today, but they could one day! Celebrate every small success and offer lots of smiles and happy words. Show them you believe they can do it. Go for walks holding hands to practice learning to walk. Offer as many opportunities as you can. If an evening walk together becomes a happy routine, your child is more likely to think of walking as an enjoyable activity. If your toddler hasn’t learned how to stack objects yet, show them! Maybe the idea had never occurred to your toddler, but once they see what you can do, they will want to try it themselves. Toys that need your child’s involvement are great for helping them understand how to interact with items in different ways. Sensory bins and activity tables are fairly easy to find online and in toy stores, or you can even make one yourself. 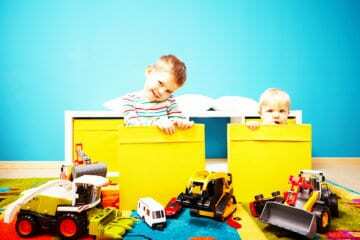 Continue putting favourite toys just far enough away from your toddler to encourage them to move toward it. Now that your toddler is starting to develop fine motor skills, a wider variety of colours, textures, and flavours will make picking up and eating food a new exciting experience. Start with an open plastic or stainless steel cup and just a little bit of water. Your toddler is probably used to a bottle or sippy cup, so a mess is to be expected. 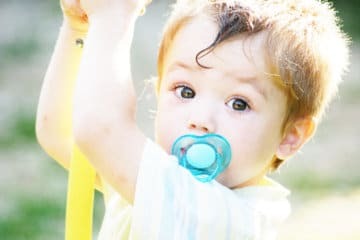 At roughly twelve to eighteen months, your toddler will likely be able to walk without help, climb onto furniture on their own, and walk up stairs while holding a railing or your hand. Turning book pages, stacking blocks, and using a large marker or crayon are common skill milestones at this age. Your toddler might also be able to squat to pick up objects and stand back up without falling over, and pick up and eat small pieces of food. 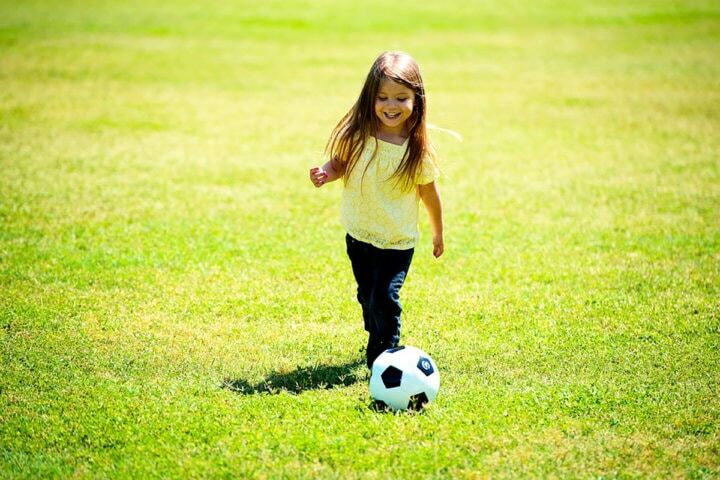 Instead of or in addition to these common skills, your toddler may start to show the ability to kick a ball and/or throw a ball. They might be able to walk down stairs while holding onto a railing or your hand. Using a spoon might also be a new skill seen at this age. Spend time in a wide open space, throwing and kicking balls. Put on some music and dance. 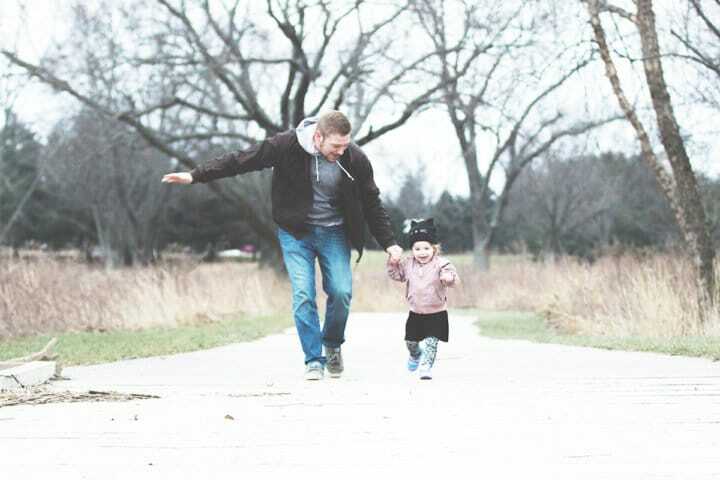 Get your toddler moving to any beat and they will learn how their body can move. Provide paper and large, easily-held markers or crayons for drawing. This helps develop those fine motor skills. Pots with lids are great for toddlers to play with and learn matching. Plastic bowls of various sizes are also good toys for toddlers to learn stacking. At roughly eighteen to twenty-four months, your toddler will likely be able to kick a ball, walk backwards or sideways, take off his or her own shoes, and remove lids from containers. The ability to drink from a cup and put it back down without spilling is usually developed by this age as well. Your toddler might be able to jump in place, open doors, fold paper in half, throw and retrieve objects, and catch a large ball. If you aren’t seeing these abilities yet, don’t worry! Children develop in different areas at different rates. If your toddler learned to crawl earlier than other children, they might learn to walk later than others. Every child is different! Running and kicking balls in a backyard or open field should be done as often as possible. Climbing on an age-appropriate playground is also a great way to get your toddler moving, and it helps tire them out! Stacking bowls and measuring cups are perfect bath toys. Keep dancing with your little one! Try out different types of music to see what they like best. Don’t baby your baby! Encourage them to ask for help before you go to help them. If you see them struggling, try to remember to say “Do you need help?” first. If they say yes, help. If they say no or keep trying to do it on their own, stand back and let them try a little longer. Offer support and opportunities for physical development through this wide range of simple activities. 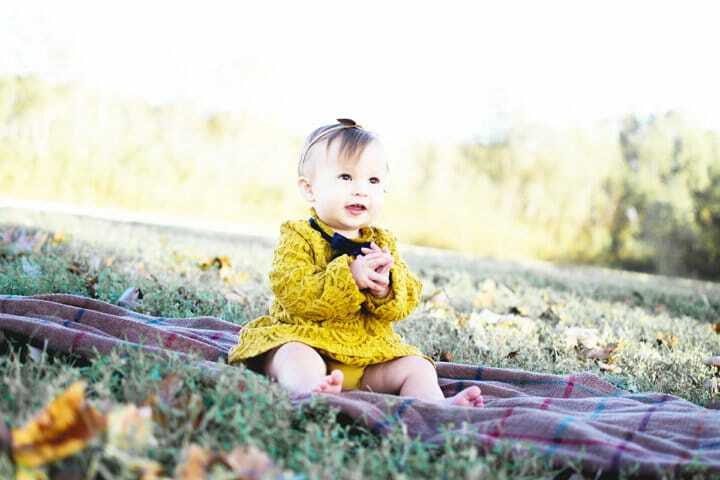 Remember that child development milestones are not the same for every child; your toddler may learn some skills earlier or later than their peers. This usually isn’t something to worry about. By roughly the age of two, your toddler will likely have established a solid foundation of both gross and fine motor skills. Over to you – what are you doing to encourage developmental skills in your toddler? 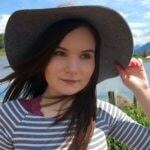 Didi Marie currently writes articles and blog posts by using her experience in content marketing and her knowledge of child education to write on these subjects. In addition to ghostwriting for clients, she writes about her interests - namely, saving money, parenting, and working on her bucket list. A true fan of the Oxford comma, Didi Marie also works as a freelance editor. When she doesn’t have a computer or book in front of her, Didi Marie loves crossing things off her bucket list and adventuring with her boyfriend and their three kids.